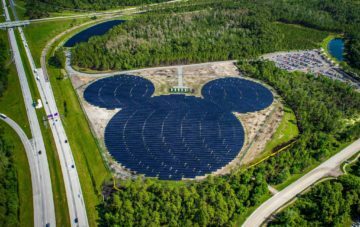 Two years ago, Walt Disney Resorts opened a Mickey Mouse-shaped five-megawatt solar installation near Orlando, Florida. Although the energy generated by those 48,000 solar panels doesn’t power rides at nearby Epcot Park, it does feed into the local electrical grid, powering 1,000 nearby homes. This iconic solar array is just one of many steps that the Disney Corporation has taken over the years to reduce its environmental impact and demonstrate sustainable corporate leadership. Now, just in time to celebrate Mickey Mouse’s 90th birthday, Disney World Resorts is preparing to flip the switch on a large, 50-megawatt solar facility located adjacent to Disney’s Animal Kingdom. 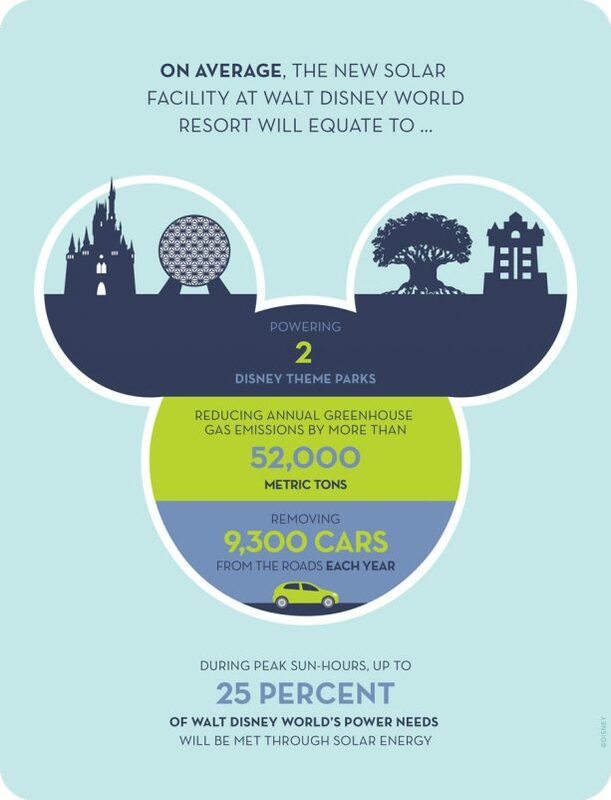 When these half a million solar panels come online, they will reduce Disney’s greenhouse gas emissions by more than 52,000 metric tons annually, helping Disney achieve its corporate goal to reduce its greenhouse gas emissions 50 percent worldwide by 2020. Although the new facility’s output would be enough to power two of the parks, it won’t go directly to the resort, but instead to the local power grid to supply energy to 10,000 homes. Projects like this one are more economical for investors in Florida since the passage of Amendment 4 in 2016, championed by SACE and other stakeholders, which removes tangible personal property taxes on solar installations for the next 20 years. And it isn’t only Disney magic in the Sunshine State that’s powered by solar: at the flagship Disneyland Resort in California, 1,400 solar panels on top of the Radiator Springs Racers ride generates enough to power more than 100 Anaheim homes. Moreover, Disneyland Tokyo’s electrical parade light show gets its glow from 600 kilowatts of rooftop solar panels. These initiatives place Disney firmly in the ranks of global, corporate brands such as Google, Facebook and Nike who embrace renewable energy not only as a way to save money, but also to position their brand as a market leader in sustainability. For those among us who enjoy a stomach-dropping roller coaster or just mingling with The Mouse, Disney gets props for using its corporate buying power to expand renewable energy and make the magic a little more eco-friendly.